ST. GEORGE – The National Weather Service has issued a “high wind watch” for the Wasatch Front and Utah’s western valleys and a “wind advisory” for southern Nevada and northwestern Arizona, both anticipating winds Thursday morning through afternoon. In Utah: Northern Wasatch Front, Salt Lake and Tooele Valley, southern Wasatch Front, Great Salt Lake Desert and mountains, west central Utah, southwest Utah, including the cities of Brigham City, Ogden, Bountiful, Salt Lake City, Tooele, Lehi, Provo, Nephi, Wendover, Snowville, Delta, Fillmore, Beaver, Cedar City and Milford. In Nevada: Northwest plateau, Lincoln County, northeast Clark County, Sheep Range, Las Vegas Valley, Caliente, Pioche, Panaca, Hiko, Alamo, Rachel, Mesquite, Overton, Moapa, Las Vegas, Henderson and Boulder City. In Arizona: Pipe Spring National Monument, Tuweep, Mt. Trumbull, western Grand Canyon. 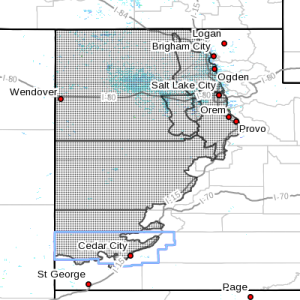 In Utah: Southerly 30 to 40 mph winds are forecast with gusts over 60 mph. Winds will shift to the northwest and become stronger for a short time behind a cold front across the northwest deserts and along the Wasatch Front, especially Utah County. In Nevada and Arizona: Southwest 20 to 30 mph winds are forecast with gusts 35-45 mph. In Utah: South winds are expected to increase before sunrise and remain strong through midday ahead of the cold front. Strong winds behind the front will drop off within one to two hours after it passes. The front will cross the salt flats late Thursday morning and the Wasatch Front around midday then move south and east through the rest of the state Thursday afternoon. In Nevada and Arizona: Winds will increase Thursday morning, peak midday and decrease in the afternoon. The high wind watch for areas in Utah means there is the potential for a hazardous high wind event. Sustained wind speeds of at least 40 mph or gusts of 58 mph or stronger may occur. The weather service predicts strong winds will make driving difficult especially for lightweight and high profile vehicles along most routes through the western Utah valleys including Interstate 15 and Interstate 80. The wind advisory of southern Nevada and northwestern Arizona means motorists may expect hazardous travel conditions due to crosswinds and areas of blowing dust. Loose objects and temporary structures may be blown away or damaged. Precautions are advised, including securing loose objects and temporary structures and checking travel conditions before driving.